A brief introduction to the land and characters of Vishnin in the Radiant Heroes series. In the world of Radiant Heroes there is a village known as Vishnin. The land is a luscious green of rolling hills, but aside from its beauty it lacks what most would consider valuable resources, like gold or diamonds. A single bountiful river cuts through the hills and provides all which the village needs to survive. It sits at the center of a rural continent and is isolated from the rest of the world – which is exactly how the natives prefer it. Almost entirely inhabited by halfling peoples, Vishnin is self-sufficient and very happy to avoid the interest of the outside world. Separating themselves from the world has preserved a rich heritage of traditions to their people. Stories of their ancestors are carried down over campfire gatherings and song and repeated word for word over generations. Often times years may pass without any foreigners passing through and so outsiders are often greeted by cold stares and unwelcoming gestures. 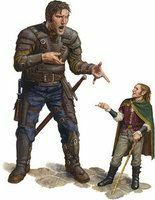 Yet, beyond the rumors of unpleasant half-people, the halfling of Vishnin are a kind and gentle nation. Those who have been welcomed found that they have simply developed a means of appreciating and honoring their own culture, rather than fighting to oppress those who believe differently. The village is, and has always been, led by a single person who is most capable and worthy. This is determined not by vote or battle, but by recognition from other citizens. Once a man or woman has proven themselves to be of a true heart and mind by the Vishnin people, they are met by tests set from the previous leader. If one is able to overcome these tests, they then assume the title and role as the new Champion. The most recent Champion, Milion, was formidable with both ax and spell. He did not believe there could be true prosperity without embracing all the world had to offer and so he sought to open the minds of his citizens to trade with nearby settlements. He was at first met with great resistance, but attempted to slowly calm the worries of his people to be accepting towards outsiders. Although most of the elder folk were not willing to change their thoughts on tourists, many of his younger friends and family were supportive in the effort. One of which was a mature halfling that Milion had raised named Vyran. Milion had always encouraged Vyran to seek strength and wisdom in both himself and the world around him. In times of challenge he would repeat,”Don’t let the unknown keep you from loving every moment” and “Never allow the fear of failure keep you from trying” until it would echo as a voice in his mind. Vyran held these words closely and never let his fear dishearten him. He repeated it when he met young Kreia and searched for the courage to ask for her hand. Then again, when she gave birth to their son Targus a year later. Vyran lived by much of Milion’s teachings and looked to him as a father figure – as many did. This is the role of a true Champion. Over the twenty years since Milion had become Champion, Vishnin had developed into its own and came to accept the outside world. In it’s prosperity, the land had attracted bandits and raiders that would take shelter among the forests and intercept convoys. Being a land of peace and culture, battle and pillaging was foreign to most of the Vishnin people. Milion sought to negotiate ending the raids, but was lured into an ambush. In a fierce skirmish, Milion had managed to slay many of the bandits, but was gravely wounded. He returned to Vishnin, using his ax as a crutch, and gave his final words to his people before passing peacefully in the Champion’s Estate. Vishnin was at a great loss and shut its gates to everyone, yet again. The town and citizens mourned the loss of their Champion, but none more than Vyran. The people looked to him for guidance and to lead them, but Vyran was unsure if he could fill the hole left by Milion’s death. He doubted that he could even dare to accomplish even a small part of what Milion hoped. He feared leading his people into the spears of raiders and falling to the terror of skulking bandits. He trembled at the thought of dishonoring Milion if he was to fail the test that was left for whomever attempted to claim the title of Champion. He believed he could do nothing, but grieve. Very well written! I look forward to reading more of this indie authors work!